Custom Military LEGO is becoming very popular indeed. Some tanks costing a fair bit of money. I actually love it. 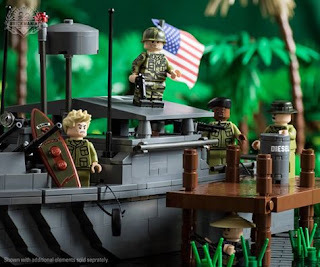 It can be WWI or WWII themed which I'm obsessed about anyway but all wrapped up in nostalgia as it's also LEGO! Check out the Net. There are some HUGE warships out there that are very special indeed and some fantastic dioramas. Not only that YouTube has a fair amount of animated films. So I've managed to get four companies who sell custom military LEGO agree to let me review their products. They are BrickMania, BrickArms, MiniFigs R Us, United Bricks and Little Legends. So expect to see reviews very soon!